Minute plastic particles pose a threat to creatures on land and could have damaging effects similar or even more challenging than in the oceans. Researchers from the Leibniz-Institute of Freshwater Ecology and Inland Fisheries (IGB) and their Berlin colleagues warn: the impact of microplastics in sediments, soils, and the freshwaters could have a long-term negative effect on terrestrial ecosystems across the globe. It is currently extensively accepted that microplastics contaminate the oceans and are damaging to marine and coastal habitats. What effect do fragments of plastic have on ecosystems “on dry land”? This question is the subject of a research introduced by IGB in collaboration with Freie Universität Berlin that reviews earlier individual studies on the topic of microplastics in relation to the effect of microplastics on terrestrial ecosystems. Although only little research has been carried out in this area, the results to date are concerning: fragments of plastic are present practically all over the world and can trigger many kinds of adverse effects. The previously observed effects of microplastics and nanoplastics on terrestrial ecosystems around the world indicate that these ecosystems may also be in serious jeopardy. Researchers from IGB have shown in previous studies that microplastics might be damaging to ecosystems when consumed by aquatic key organisms. Every year more than 400 million tons of plastic are manufactured globally. It is estimated that one-third of all plastic waste ends up in freshwaters or soils. Most of this plastic disintegrates into particles smaller than five millimeters, termed as microplastics. This further breaks down into nanoparticles, which are less than 0.1 micrometer in size. In fact, terrestrial microplastic pollution is a lot higher than marine microplastic pollution – an estimate of four to 23 times more, based on the environment. Sewage, for instance, is a vital factor in the distribution of microplastics. In fact, 80 to 90 % of the particles found in sewage, such as from cloth fibers, persist in the sludge. Sewage sludge is then repeatedly applied to fields as fertilizer, meaning that massive tons of microplastics end up in the soils annually. Some microplastics display properties that might have direct destructive effects on ecosystems. For example, the surfaces of minute fragments of plastic may carry disease-causing organisms and act as a vector that conveys diseases in the environment. 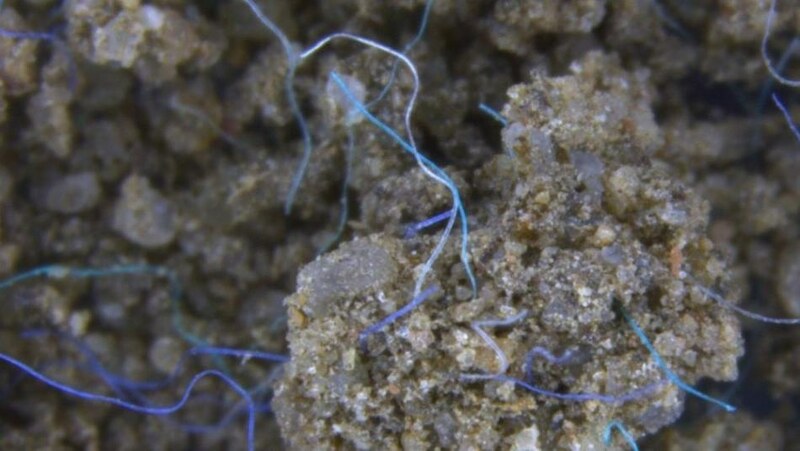 Microplastics can also interact with soil fauna, impacting their health and soil functions. Earthworms, for instance, make their burrows in a different way when microplastics are present in the soil, impacting the earthworm’s fitness and the soil condition. Largely speaking, when plastic particles break down, they gain new chemical and physical properties, increasing the risk that they will have a lethal effect on organisms. Thus the more likely it is that deadly effects will occur, and hence the greater the number of potentially affected species and ecological functions. Chemical effects are particularly problematic at the decomposition stage, as observed by the team of authors led by Anderson Abel de Souza Machado. For instance, additives such as Bisphenol A and phthalates leach out of plastic particles. These additives are known for their hormonal effects and can potentially disturb the hormone system not only of vertebrates, but also of numerous invertebrates. Moreover, nano-sized particles may cause inflammation; they may traverse or alter cellular barriers, and even cross extremely selective membranes such as the blood-brain barrier or the placenta. Within the cell, they can activate changes in gene expression and biochemical reactions, among other things. The long-term effects of these variations have not yet been adequately explored. However, it has already been revealed that when passing the blood-brain barrier, nanoplastics have a behavior-altering effect in fish. Humans also consume microplastics via food: they have already been spotted not only in fish and seafood, but also in sugar, salt, and beer. It could be that the buildup of plastics in terrestrial organisms is already common universally, the researchers guess, even among those that do not “ingest” their food. For instance, minute fragments of plastic can be stored in yeasts and filamentous fungi. The intake and uptake of small microplastics could turn out to be the latest long-term stress factor for the environment. Presently, however, there is a lack of standardized techniques for establishing microplastics in terrestrial ecosystems so as to create an accurate assessment of the situation. It is largely a difficult and labor-intensive process to detect minute fragments of plastic particles in soils, for instance. The new IGB research highlights the significance of reliable, scientifically based data on degradation behavior and the impacts of microplastics. This data is essential to be able to respond effectively to contamination by microplastics and the danger they pose to terrestrial ecosystems – where, after all, most plastic waste that enters the environment buildup.